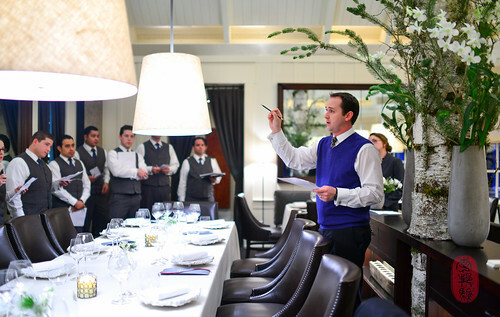 The twelfth day of Christmas dawned with a second wind of excitement at The Restaurant at Meadowood. When I arrived at the kitchen in the morning, as I did every day of this dinner series, the cooks seemed to move with the efficiency and confidence of having their home field back. 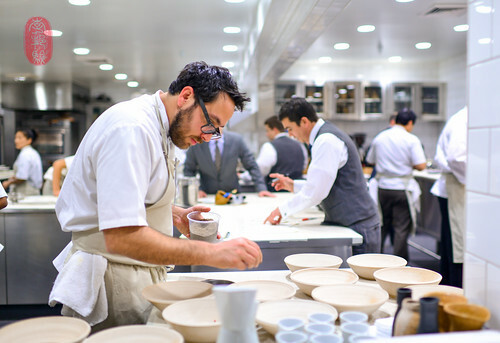 In the days leading up to this last dinner, Christopher Kostow and his team had, essentially, been working in eleven different kitchens with eleven different personalities, and learning eleven different styles of management, workflow, and plating. But on this last day, with all of the guest chefs gone, the staff seemed to fall back into their familiar corners and routine. The kitchen hummed along; leaner, quieter, calmer. As Perry Como crooned about a white Christmas on the speakers, I plugged in at my usual perch at the kitchen table with a cup of coffee and my Model Bakery English muffin. Until now, I’ve only been giving you short summaries of the dinners. But, the Twelve Days of Christmas at The Restaurant at Meadowood is a much greater endeavor, one that I’ve had the great privilege of experiencing twice now (last year, as a guest participant, this year as the official, hired photographer). It not only moves the culinary spotlight, for two weeks, to Napa Valley – pointing it at the community that supports and works with The Restaurant at Meadowood – but also benefits a local charity – the Holly Cranston Memorial Fund. I’d like to take a moment, in this last post, to tell you a bit about what happens beyond dinner service, and the amazing people who make it happen. Coordinating eleven guest chefs (often, this included an assistant chef as well) is not an easy task. 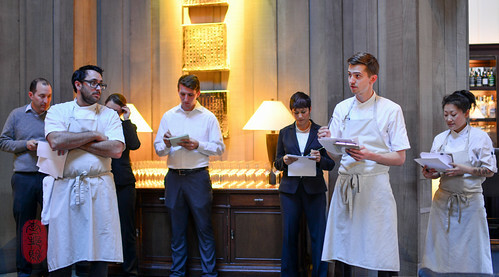 (Actually, this year, there were thirteen guest chefs, since Del Posto was represented by both Mark Ladner and Brooks Headley, and Bar Tartine was represented by both Nicolaus Balla and Cortney Burns). But Heidi Brown, the culinary liaison (and Christopher Kostow’s assistant) at The Restaurant at Meadowood made it seem effortless. She was basically administrative command central for the the Twelve Days of Christmas, and an all-around concierge to the guest chefs. She scheduled their flights (and mine) – all of which were sponsored by United Airlines, by the way – and our airport transfers. She also worked with Meadowood Napa Valley to reserve our rooms, and make sure that our amenities and gift packages (which included personalized chef coats and aprons) were correctly assigned. Brown was in charge of scheduling daily interviews for the chefs with local press. 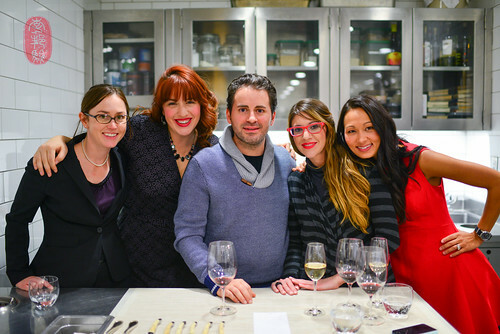 She was also the mastermind behind the five panel discussions that I helped moderate, two of which took place at the Culinary Institute of America’s Greystone campus, and three at Meadowood Napa Valley. When she wasn’t triangulating chefs, packages, or the restaurant’s Instagram accounts (along with Martina Kostow), she was problem-solving and fulfilling special requests for the guest chefs – Rodolfo Guzman, for example, needed seventy buckets of a specific size for his curanto dish; Andy Ricker needed woven baskets in which to serve sticky rice. And, if someone needed a ride to late-night karaoke at Ana’s Cantina after dinner service – Heidi Brown was always your gal. Nathaniel Dorn, the restaurant’s general manager, oversaw the front of the house service. Each day, the dining room had to be reconfigured to accommodate different party sizes and different seating requests (managing the reservation requests, alone, is a monstrous task, overseen by Brook Herrema and Makayla Harp). At 16.00, Dorn gathered the front of the house staff to meet the guest chef(s) and Kostow, and to go over the night’s menu: proper markings (utensils) for each dish, dietary restrictions, and table-side presentations, as well as wine service (under the direction of head sommelier Benjamin Richardson, formerly of Frasca Food + Wine, with the two assistant sommeliers, Victoria Kulinich and Marty Winters). At 17.00, the front of the house lined-up for a second time to run through the guest list, making note of special requests, re-reviewing the list of dietary restrictions, and flagging VIPs. By the end of this meeting, the front-of-the-house staff was expected to have memorized the entire menu for that night (including the provenance of many of the ingredients), as well as the entire guest list. 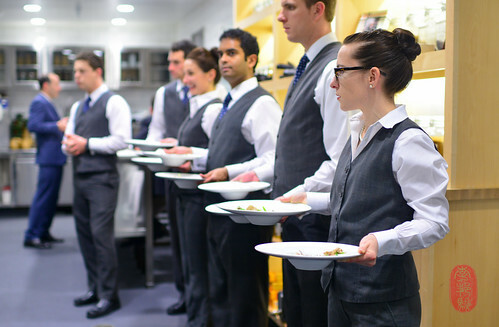 At 18.00, the front of the house staff had to be in place to welcome guests, who were ushered into the kitchen for an hour of Champagne and canapés. At the end of that hour, by some magical combination of memory and careful note-taking, Herrema and the hostess, approached each guest by name to take them to their seat in the dining room. During service, Dorn stood at the pass with head expeditor Jeremy Rupp, to ensure that the dishes left the kitchen neatly, quickly, and in the right order. After each dinner service, the appointed, or lead sous chef for the following day would convene a short kitchen staff meeting to review the next day’s prep list. In the mornings, the lead sous chef for that day was often the first one in the kitchen (I know, because I would often be the only other person to arrive that early). For the rest of that day, the lead sous chef directed traffic and made sure that all of their guest chef’s needs were met. Additionally, the lead sous chef of the day was responsible for running the morning kitchen line-up with their guest chef, as well as giving Kostow’s menu notes to the front-of-the-house staff in the afternoon line-up. By entrusting the logistics of prep and service to his sous chefs, Christopher Kostow is cultivating a kitchen of managers. While this kind of responsibility put an incredible amount of pressure on these sous chefs, the Twelve Days of Christmas presented an incredible opportunity and education for them. Not only did they get hands-on experience managing a Michelin three-starred kitchen, but they also got the chance to work with some of the most-seasoned and respected leaders in their industry. If anyone was omniscient and omnipresent during the Twelve Days of Christmas, it was Christopher Kostow, host of the Twelve Days of Christmas and chef of The Restaurant at Meadowood. He not only had his mind wrapped around all of the activity in and outside of the restaurant, but, I’m convinced that he often appeared in two or more places at the same time. Over the course of twelve dinners, he and his team managed to produce at least sixty different dishes, most of which had never been attempted before. While I can’t say that every dish succeeded on equal footing (Kostow would be the first to admit this), I was impressed by the overall strength and quality of the food that he and his cooks produced on a consistent basis. And this is one of my favorite aspects of the Twelve Days of Christmas: there is an excitement and sense of adventure in Kostow’s collaboration with the guest chefs. For those who embrace and appreciate this collaborative spirit, these dinners can be a incredible place of discovery. I don’t think you had to have eaten all twelve dinners to feel and taste the dynamic dialogue that transpired between this year’s guest chefs and Kostow. All of this year’s guest chefs had their own unique and vivid voices. I count myself incredibly lucky to have heard all of them sounding off the hills of Napa Valley in their various pitches and tenors. If you studied them closely, each of this year’s menus presented lively, intelligent conversations about culture, history, and perspective. One chef brought with him the flavors of the Mapuche Indians of South America; another cooked soulful dishes of her American South. We experienced Thai, Japanese, and Italian cuisines through non-Thai, non-Japanese, and non-Italian lenses. Rasmus Kofoed took us to the forests of Denmark by way of Napa; David Kinch took us to the tidal pools of California. There is an excitement to new and developing dishes; a special kind of energy to food that is striving upwards and outwards. And I don’t say this apologetically. Of course, the food needs to be executed properly, and the flavors need to be somewhat balanced (at The Restaurant at Meadowood, this isn’t a problem). But I see value in risk, and find lessons in the unperfected. Some of my best meals are those that demonstrate a palpable momentum towards an unachieved target. Flawless though products by rote may be, often, I find their color muted by repetition. Better instead, it sometimes is, to experience the honesty of trial and error. And so, even though many of Kostow’s dishes at this year’s Twelve Days of Christmas weren’t, by his standards, “finished,” I count many of them among my favorite ones. In fact, a couple of the best dishes I’ve had in 2013 appeared during this dinner series (as soon as this post publishes, I turn to compiling my year-end lists of best dishes, desserts, and restaurant meals). I have to admit that I was a bit worried about Kostow’s “brown rice risotto” at this last dinner. The sound of it immediately prompted fears of soggy, broken kernels swimming in a soupy broth. To the contrary, the rice kernels were shockingly firm; perfect, actually. The porridge was thick and velvety, rich with the flavors of cuttlefish, matsutake, and pine. I loved it. Kostow smoked eel over burning staves of cabernet oak barrels. He served the eel, along with tender cubes of beef tongue, on staves stained with cabernet sauvignon for added flavor and aroma. This was delicious. Ending on a particularly strong note, Kostow wrapped up this year’s Twelve Days of Christmas with an amazingly fragrant apple lees sorbet, served with a fennel cake and roasted white chocolate. It was, by far, my favorite dessert of the entire dinner series. Perhaps, it was the home field advantage. Perhaps, it was the excitement of the final night. Or, perhaps, it was the wine – Krug flowed like water, followed by a vertical tasting of Harlan Estate cabernet sauvignon. Regardless, this last night was my favorite night of this year’s Twelve Days of Christmas. The entire menu from Christopher Kostow’s dinner, with wine pairings by the guest vintner Harlan Estate is below, along with a slideshow from the twelfth day of Christmas at The Restaurant at Meadowood. If you would like to see the photos in a larger size, click through the slideshow to the Flickr album. Mustard of must, poached tongue. Photos: The staff of The Restaurant at Meadowood after the last dinner service; Brooke Herrema, Heidi Brown, Matt Accarrinio, Catherine Schementi, and Martina Kostow; Nathaniel Dorn runs front of the house line-up at The Restaurant at Meadowood; Christopher Kostow and Miles Pundsack-Poe, with sous chef Katianna Weiner running line-up; Christopher Kostow plating; servers lined up in the kitchen ready to run food; Harlan Estate wines paired with the dinner. ~ by ulterior epicure on December 26, 2013.